An AltaRica node is a component of the system. Its interface with its environment is divided in two parts: events and flow variables. The first ones represent actions of the environment or of the component itself, in fact any phenomenon that can change the state of the component. Second ones are shared variables that can be used to model data circulating into the system. Events may change the state of the component; this one is described by the mean of state variables. While flow variables may evolve according to modifications of the environment, state variables change only on occurrence of events; this means that between two events of a node the value of its state variables do not change. In the sequel, an assignment of state and flow variables is called a configuration. The changes of state variables on event occurrence is described using transitions. The relationship between flow and state variables is described by means of assertions. The description of a node starts with the keyword node and terminates with edon. The name of the node is given after the node keyword. Since a node may occur several times in a system (e.g. a switch), each node description defines a type of nodes. Actual instantiation of nodes is done in the sub section of hierarchical nodes. Declarations of variables are introduced by the keywords state or flow according to the kind of declared variables. Declarations consist in a comma-separated list of identifiers followed by a colon (:) and the domain of the variables. Each declaration is terminated by a semi-colon (optional for the last one). Generic attributes can be attached to variables. Theses attributes are simply labels that are interpreted by tools; they are given after the domain (a colon separates the domain and the list of attributes). The following example associates orientation attributes, in and out to flow variables. Remember that in and out are just labels and have no particular meaning here; the semantics of these labels is specific to each tool (e.g. the translator to the Lustre language). The init keyword introduces the initialization part of the node. Only state variables can be initialized. Remember that flow variables are shared variables thus their initial valuation can not be specified by a simple assignment. As explained below the value of flow variables depends on state variables and the environment of the node; this is also the case for their initial values. init is followed by a comma-separated list of assignments (:=) of state variables. The semantics of AltaRica nodes considers that not initialized variables may take any possible value in their domain (up to assertions satisfaction) at the initial state. Events are labels used to represent state changes. The declaration of events is introduced by the keyword event followed by a comma-separated list of identifiers. Like variables attributes can be attached to event. The following example presents a switch node with three events: open, close and stuck. Two attributes can be used to indicate that open and close are normal actions and that stuck models a failure. Each node is equipped with an implicit event called ε (epsilon). This event denotes the idleness of the node and is always possible/enabled (see transitions). Assertions are Boolean expressions used to describe invariants on variables. All configurations of a node must satisfy specified assertions. They are introduced by the keyword assert. Assertions are listed using a semi-colon as separator. These invariants can be used to describe relations between flow variables as a transfer-function but also they model relationship between states of the node and the value of its flows. The following example describes a node that simply translates some Boolean “input” into an integer “output“. 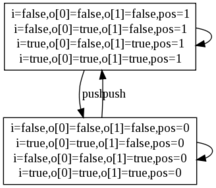 The translation of the Boolean “input” is written using an assertion that specifies that when input is true then output is 1 and 0 in the other case. a list of assignments of state variables. Transitions are introduced by the keyword trans. Assignments of flow variables are those ones that satisfies assertions. flow variables are computed according to state variables and assertions. 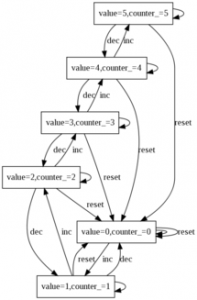 Below we give an example of a node that models a counter. 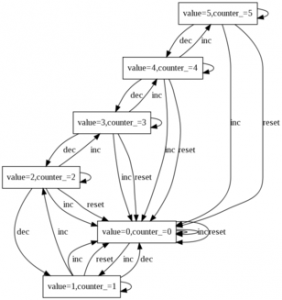 The value of the counter is memorized into a state variable counter_ and is shared with the environment using a flow variable value. The environment can modify the value of the counter using three events, inc, dec and reset that respectively increment, decrement and reset the counter. The transitions for inc and dec are guarded in order to prevent the counter_ to go out of its domain. In fact these guards are redundant with assertions implicitly introduced by the domains of variables. Since the semantics of the language enforce the new assignment of state variables to satisfy assertions the new values of state variables remain in their domain. In order to handle the event ε, an implicit transition is add to the node; its guard is true and it does not change state variables. S is the set of states and contains all configurations that satisfy the assertions. E is the set of events of the node (containing the event ε). t is a valid configuration computed from the transition specification. I is the subset of initial states. A configuration belongs to I if it satisfies both the assertions and the initial assignment of state variables specified in the init section. Gérald Point. AltaRica: Contribution à l’unification des méthodes formelles et de la Sûreté de fonctionnement. Thèse de l’Université Bordeaux I, 2000. A. Arnold, A. Griffault, G. Point and A. Rauzy. The AltaRica formalism for describing concurrent systems. Fundam. Inf. 40, issue 2-3, pages 109-124, IOS Press, 2000. G. Point and A. Rauzy. AltaRica. Constraint automata as a description language. European Journal on Automation, 33(8-9):1033-1052, Hermes, 1999. The following example is the one used in Assertions section. It models a transfer-function translating a Boolean value into an integer one; the semantics of the node is depicted after its description. The event ε has an empty label. Here we come back on the example of a counter given in the previous section. In this version we have mixed the normal counter and the buggy one. The erroneous behaviour is enabled by a global Boolean constant called BUGGY_COUNTER. Below we give the semantics of the node for both values of the constant. The following example is a switch that directs an “input” stream to one way or another. An event called push is used to describe the action of a user. The event changes the current position pos of the switch. The assertion describes where the stream is connected. As previously the semantics of the node is given after the AltaRica code below; this time we gather all configurations that correspond to a position of the switch (i.e. pos = 0 or 1). The semantics of arrows between bundles of configurations mean that there exists a transition between each configuration of both bundles. In particular the reader should notice that transitions labelled by ε (i.e. without label on the picture) make a loop, that means that flows of the node can change without any modification of the internal state (i.e. position) of the switch.